The first time Beth ate this pizza was wonderful to watch, you had to be quick though, it was gone in a flash! It was her first ever stuffed crust and she loved it. 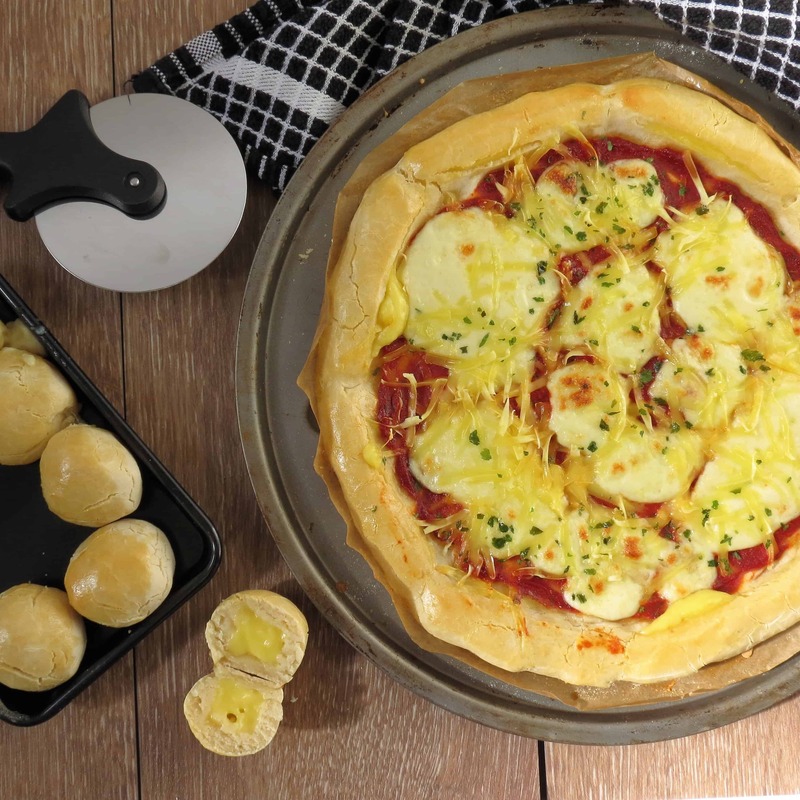 This recipe is so easy and I’ve adapted it over time to include the stuffed crust and my all time top tip for this dish is – brush dough crust with egg (or milk) I promise, it’ll make all the difference to the appearance. We do after all eat with our eyes first! Scroll down to the bottom of the page to see photo’s I’ve added since writing this blog with different toppings and different style crusts, this dough is so versatile that if we’ve fancied an Italian crust that evening I’ve made half the dough and pressed the base out thinly, either way is delicious. On this occasion I decided to use half the dough to make cheese stuffed dough balls, simply divide the dough into 8 balls and press some of your favourite cheese into the middle, make sure the dough is well sealed so that no cheese escapes! These cook for the same period as the pizza. Half the dough and begin to shape one half into a disc place onto pizza tray and stretch, tease, push dough towards the sides. To create a thicker crust stop once you've reached the sides, to create a stuffed crust keep teasing the dough out until you have an overhang of about 1 inch. For stuffed crust add the fingers of cheese around the pizza base just in from the pizza tray edge, leave enough dough hanging off the tray to fold in over the cheese. Fold the crust over to cover the cheese and gently press down to seal in. Brush the crust with beaten egg. To make the tomato sauce I add nearly a whole tube of tomato puree to a glass and add a few splashes of water to thin the puree, I also add whatever herb takes my fancy, sometimes is oregano, other times it's basil but pesto works really well too - don't be too prescriptive on amounts, have fun experimenting! Below are some more images of Pizza I've made recently but this time I used Doves Farm Strong White Flour, you need to add 1/4 tsp of white vinegar to the recipe above, two eggs and 4blsp of oil. The mixture isn't so easy to mould into a stuffed crust but the end result is a lovely light base. The cheesy dough balls you can see in the picture were made using an Isabel's Dough Ball Mix, I thoroughly recommend them as they're very morish!